Check to make sure you entered the same email address you gave us for your account and your correct password. If you are still having problems, please contact us via our contact us page. What if I forgot my password/username? Please visit the forgot password page for our automated password/username lookup form. You can also contact via our contact us page. What if a client asks for my personal contact information? Please contact us as soon as possible, and we will take immediate action. We like our psychics to have experience giving readings to people before submitting an application. However, we sometimes work with inexperienced psychics to develop their natural reading skills and their style. I am not in the United States or Canada, can I still work for PsychicOz? Yes. PsychicOz accepts psychics from around the world as long as you pass the tests and verifications and speak English well. What are the benefits of working as an online psychic for PsychicOz? No membership fees! Joining PsychicOz.com is absolutely free! Get a Competitive Base Pay & Receive Excellent Bonuses Based on Your Monthly Earrings! Partnering with us allows you to be a member of an elite group of psychics who have a lifelong dedication to helping people make positive changes in their lives. Work from anywhere in the world! You can work from the comfort of your own home, office or even your favorite cafe' using our free, innovative tools. Set your own schedule - You can set your own hours and work on your own time! 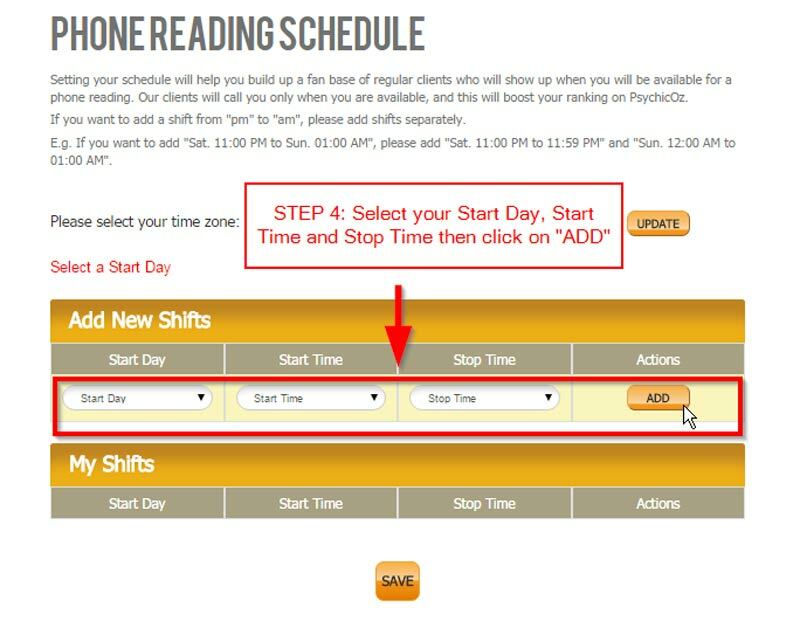 Please Note: You must be available for phone readings and be logged into your PsychicOz account to keep your online status. How do you promote my service? Our website search capabilities allow customers to narrow the focus of psychics who are right for them. We limit the number of areas in which a psychic specializes in order to show a more targeted list. We promote our psychics on high authority websites such as like google, Facebook, YouTube, Bing and Twitter. We have the best reviews of other psychic websites. How do I share my psychic gifts through PsychicOz? At PsychicOz, we are pleased to offer our gifted psychics the tools they need to capitalize on our growing customer base. Our psychics can share their talents and earn income through our email and phone reading services. How do I protect my identity? How much information should I give out to users? Protect your psychic/personal information at all times. Should you receive a message asking for your studio/personal information (User ID, Passwords, Identification numbers, email address, permanent address, etc. ), DO NOT respond. 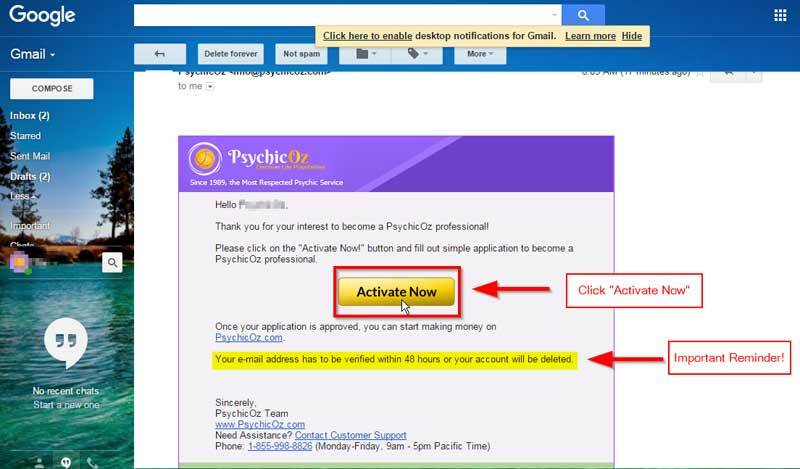 These are fraudulent emails and are NOT from PsychicOz Inc. 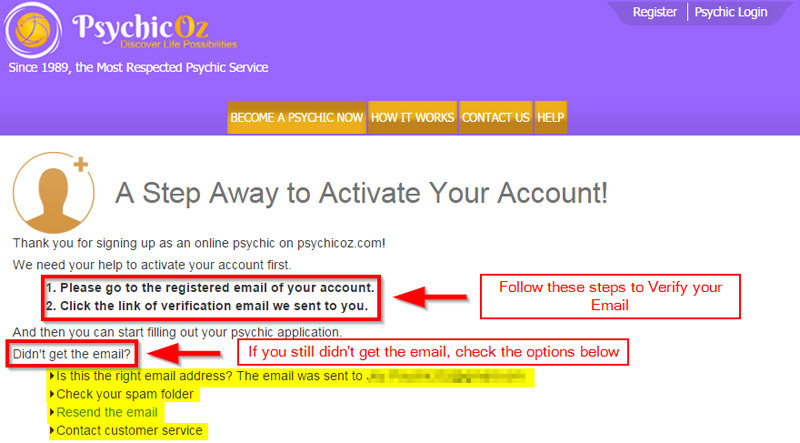 If you are redirected to a page that is not one of the PsychicOz site, DO NOT enter your psychic/personal information. Instead, report the message immediately using our contact us form. What if a member repeatedly asks me for personal information? Do NOT, under any circumstances, give out your personal information. Please report this client using our contact us form. Will my real name be displayed on my profile? No, only your username will be displayed on your profile. Please contact us, and we will let you know if we can change it. What kind of setup do I need to get started on PsychicOz? You need your regular computer and access to internet to offer email readings and a phone (landline or cell) for the phone readings. No special technical requirements are necessary. Do I need to have skype or camera when doing a phone reading? No, you don’t need skype or camera. They are simply audio calls thast can be done with your regular mobile or landline phone. Do I need a photo? Yes. We’ve found that a real photo has a huge impact on your ability to reach new customers. In fact, it is almost as important as the sound of your voice in making the initial connection. Do you have required minimum hours to keep my account active? We ask that you have a minimum of eight and a maximum of 60 hours/week according to the schedule you set, although we recommend starting with 20-25 hours/week for best results in building a loyal client base. When I click the link to confirm my account, it lands on a page stating “Link Is No Longer Valid.” What should I do? You only have 48 hours to confirm your account. If you clicked the link after 48 hours, then it will say, “Link Is No Longer Valid.” Please contact support. 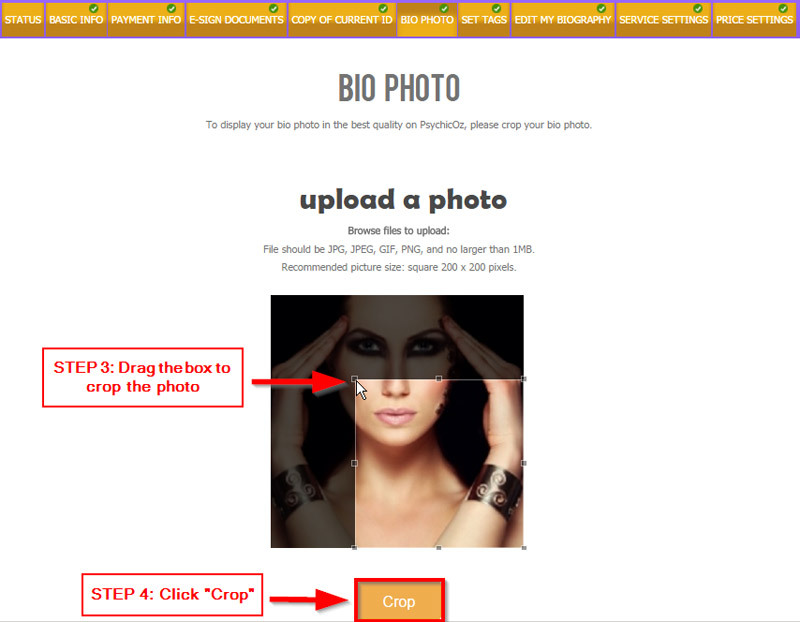 How do I upload my Bio Photo? How do I manage my phone schedule? Where do I see my earnings? Please note: We follow UTC time zone for all your earnings statements. How do I create my audio profile? *** If you don't have an audio profile file, please use online service like https://www.speakpipe.com/voice-recorder or https://online-voice-recorder.com/. They are all Free! ***Please note that you are not allowed to share any of your contact details (like phone number, email, social profile or your own website). How do I setup my account to receive only email reading requests (no readings by phone)? 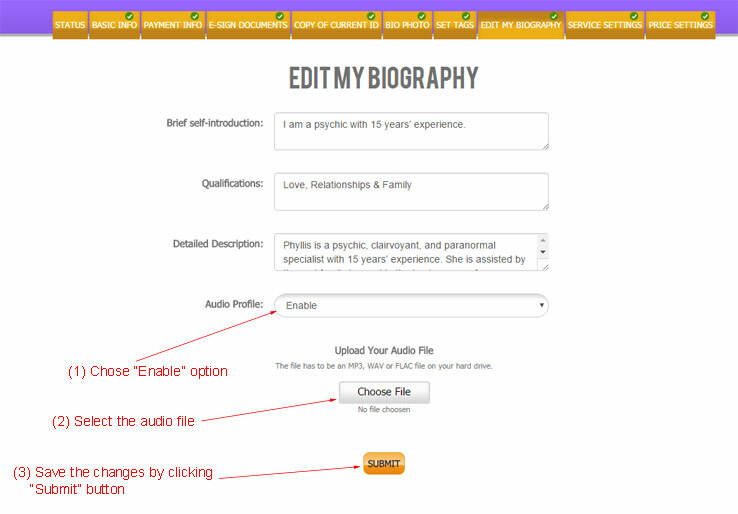 Login to your Psychic profile, click on Status and then click on edit the "Service Settings". 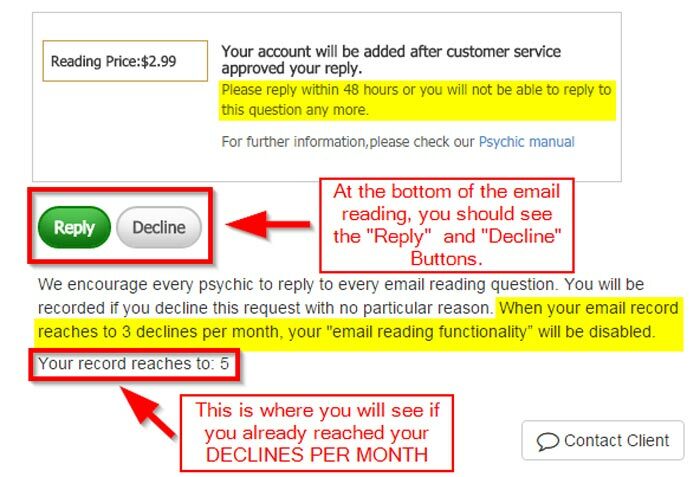 You will reach a page where you can turn off either the email readings (if you want to provide only phone readings) or turn off the phone readings (if you want to provide just email readings). This feature is ideal if you need to take time off for more than a couple of days. You can turn on/off the services you provided at any time you want. Do I have to be logged in to a system during my phone reading schedule? No, you don’t have to be logged in to your computer. Just ensure that your phone line is available. 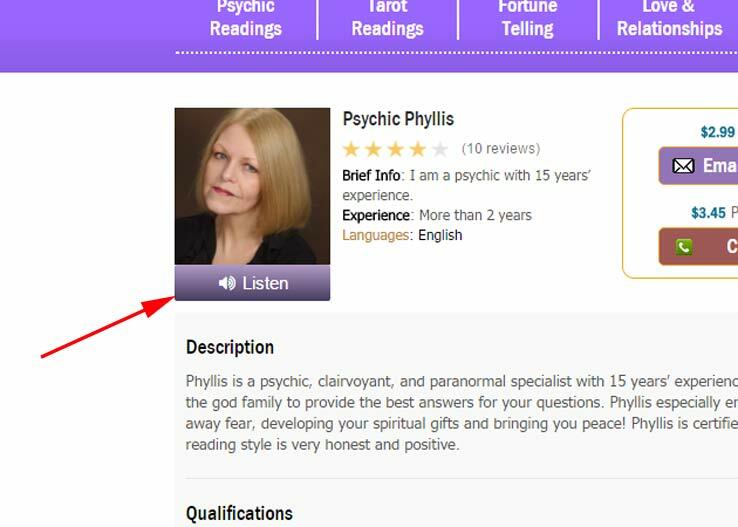 How will I know when a PsychicOz client is calling me for a reading? When a client is calling you, you will see USA phone number 1-855-212-8170 on your call display. We highly recommend adding this number to your contacts and saving it as your PsychicOz contact number. Will you display my phone number to a client? No. Clients will not be able to see your personal phone number. We respect your privacy. Does every phone reading start with three free minutes for a client? No, only new clients will get three free minutes and these minutes will be given to them only once. It helps our psychics explain our services with no need to rush. What happens if a client's funds run out during my phone reading? In this case, our system will end the phone reading automatically. However, you and the client first will hear three short beeps that indicate the call will end in one minute. Who pays for the phone calls? Our phone system covers the phone call rates. You will receive incoming calls from our toll free number, which are free calls with almost any phone plan. 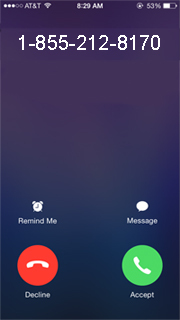 If I am not able to answer the call, will the client be able to leave a voicemail? No, due to privacy concerns, the client cannot leave a voice mail. How can I use contact client feature for an email reading ordered by a client? Feature allows you to clarify any information before you reply to an email reading. You should not give an email reading through contact client. Please use the “Reply” button to reply to your email reading (See screenshot below). How do I connect with a client? Only the client can initiate the conversation with a psychic. A client can contact a psychic either by phone or by email, depending on psychic's readings settings and client's preferences. 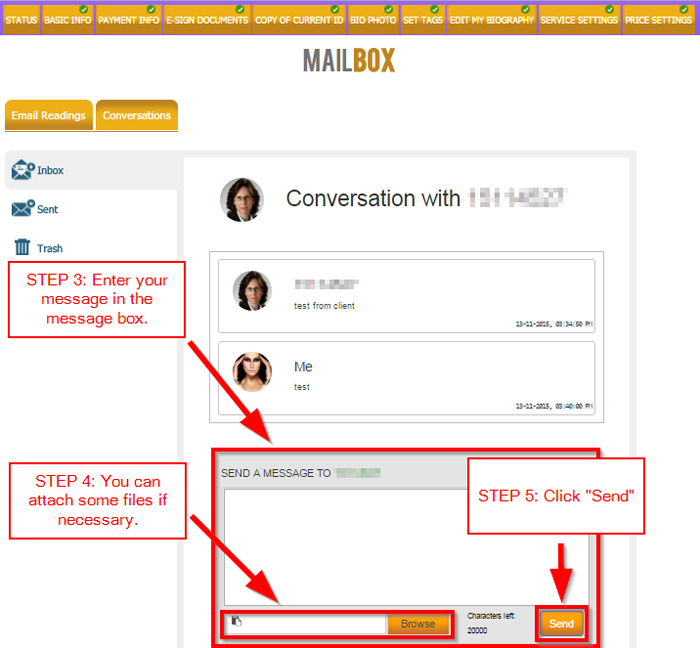 ***Please note: it is not allowed to give up any of your own personal contact information with this feature. Will you display my personal email address to a client? No. Clients will not be able to see your personal email address. We respect your privacy. How soon should I reply to an email reading? Please try to reply within 24 hours. Everything you earn over the past month will be paid on the first week of the following month. Our compensation program is comprised of a guaranteed base rate for talk time and email reading requests you will answer. In addition, we have a bonus program that is based on your last month earnings. For more information about bonuses, please see next question below. How does the bonus program work? *All bonuses are based on your last month earnings. Am I paid if I reply to any additional questions related to the reading? No. You need to ask the client to create another email reading request in order to be paid for an additional one to two questions. 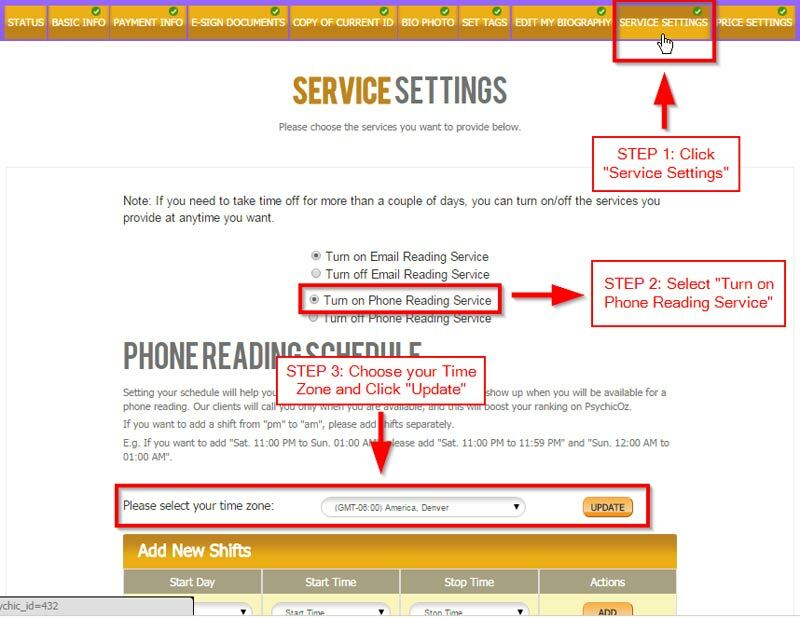 You also can request that the client initiate a phone reading with you. May I get my pay thru direct deposit or by check? We use PayPal as our only current payment option because it is fast, safe and reliable. PsychicOz is an easy, convenient way for psychics to share their natural abilities, assist clients in their spiritual journey and earn money. How old do I have to be to apply for a psychic job on your website? 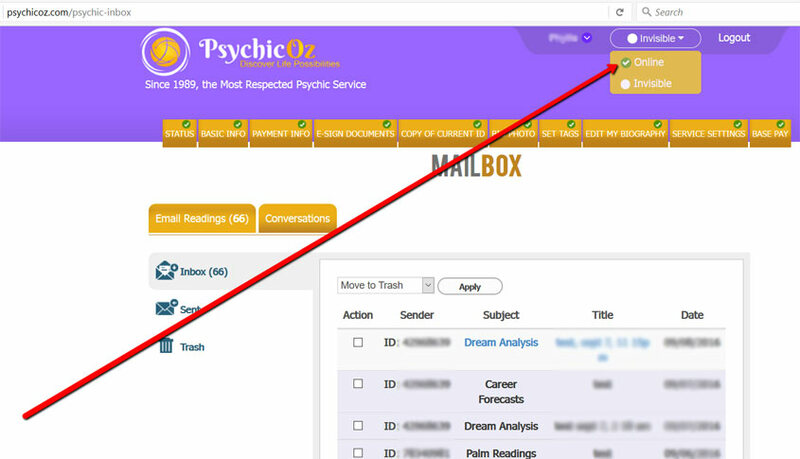 Does PsychicOz provide secure and reliable service? 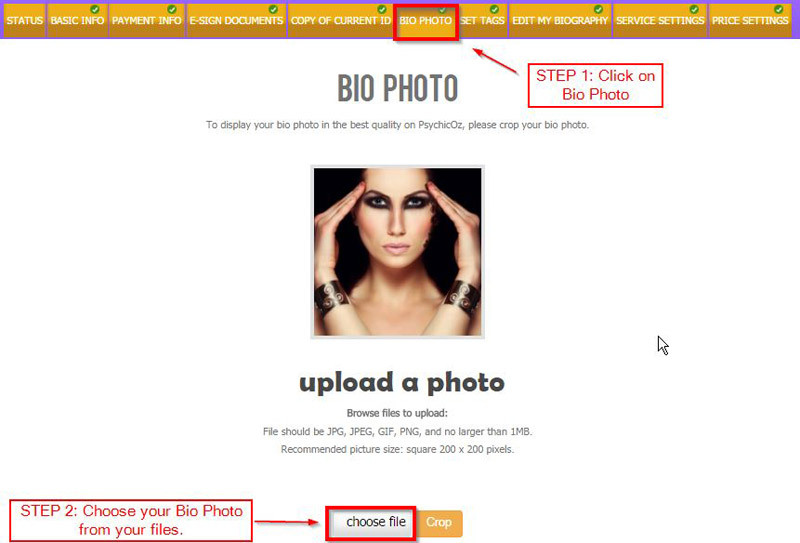 PsychicOz is a 100% secure website. We use the latest technology to ensure your personal information and privacy is always protected. 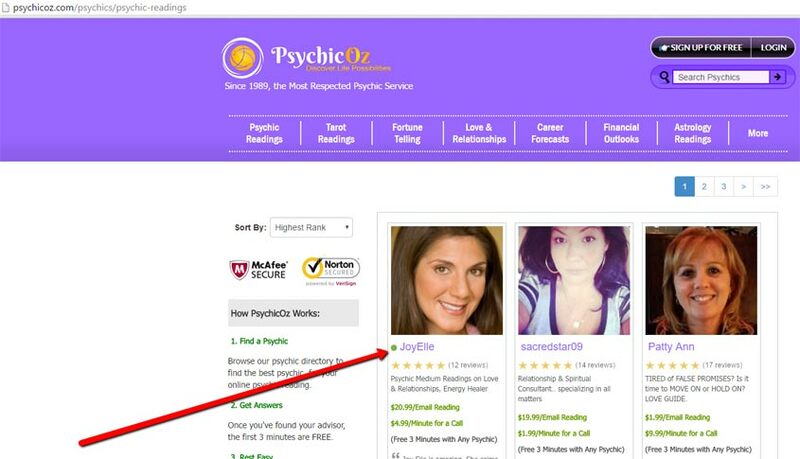 Are psychics on the site considered employees of PsychicOz? PsychicOz psychics are independent contractors, so you manage and set your own schedule. We ask that you have a minimum of eight and a maximum of 60 hours/week according to the schedule you set. We do recommend starting with 15-20 hours/week for best results in building a loyal client base. If you wish to cancel your account, please contact our support team. I already deactivated my account, can I activate it again? Yes, if you requested to just “deactivate” your account, we can still reactivate your profile but if you requested to “delete” your account, you will need to create a new account. You may use the same username and email. Why am I not getting any phone/email readings? Check if your phone/email reading is turned “ON” from the “Service Settings” page. 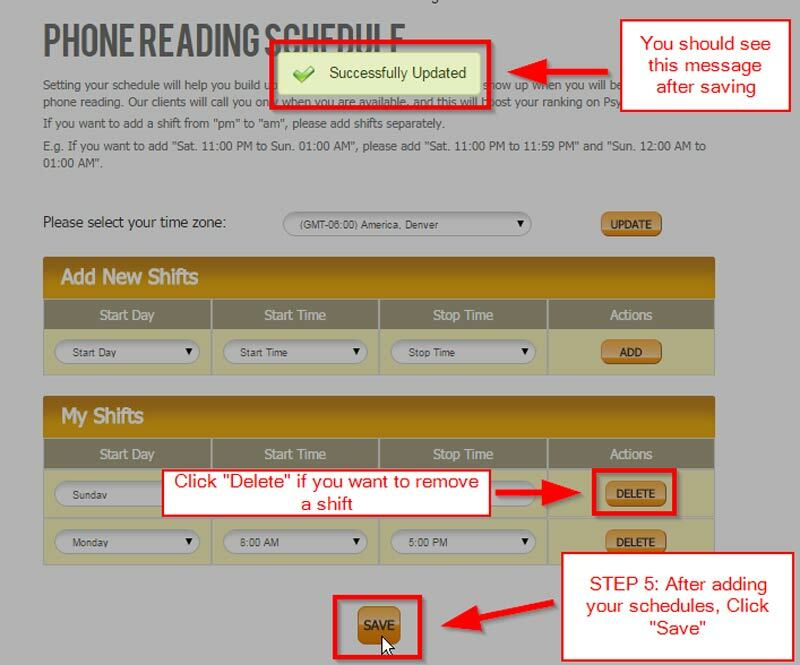 Check if you have saved correct phone schedule in the “Service Settings” page. Check if your phone number is verified on "Basic Info" page. Make sure your profile is encouraging to clients and includes an interesting biography and description. Check that spelling and grammar are correct. Double-check your keywords under “Edit My Biography” and categories under “Set Tags”. Read this article that will help you to get your first clients. Can I work with other psychic sites? Yes, as long as it doesn’t conflict with your schedule and all PsychicOz clients pay thru PsychicOz.com. Still Confused? Email, Call or chat with us!